Owen Griffiths (right) celebrates scoring against London Raiders. 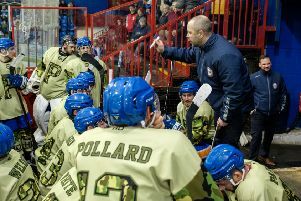 Head coach Slava Koulikov insists league form will count for nothing when Phantoms head into NIHL Autumn Cup battle tonight. The city team travel to Swindon for the first leg of a semi-final showdown (7.45pm). Phantoms boast a fine record against the Wildcats this season, having collected seven points from a possible eight in their four NIHL Division One meetings. “It will be totally different in a cup semi-final, though,” stressed Koulikov. “In a league game we are playing over 60 minutes for two points, but the semi-final is all about making sure we come out on top after 120 minutes. “I’m happy to be away in the first leg and the aim is quite simply to bring the tie back home to our building with a realistic chance of reaching the final. “We’d love to nick a win in Swindon or come away level. Being one or two goals down wouldn’t be a disaster, but we cannot afford to dig ourselves a hole by falling any further behind than that. “We need to be solid defensively and take advantage of any mistakes that Swindon make. They may well play a bit differently as they will want to build a lead. “Swindon is a rink where we know we can play hockey. We maybe have an edge in terms of results, but they are usually very close games between the two teams and that is something I do expect to continue. The current campaign could be Phantoms’ finest since their honours treble at English Premier League level back in 2009. Forward Owen Griffiths - a former Swindon player - returns after sitting out the NIHL Division One South success at London Raiders last Sunday due to university exams. The return clash is at Planet Ice on January 18. Basingstoke and Hull contest the other semi-final.